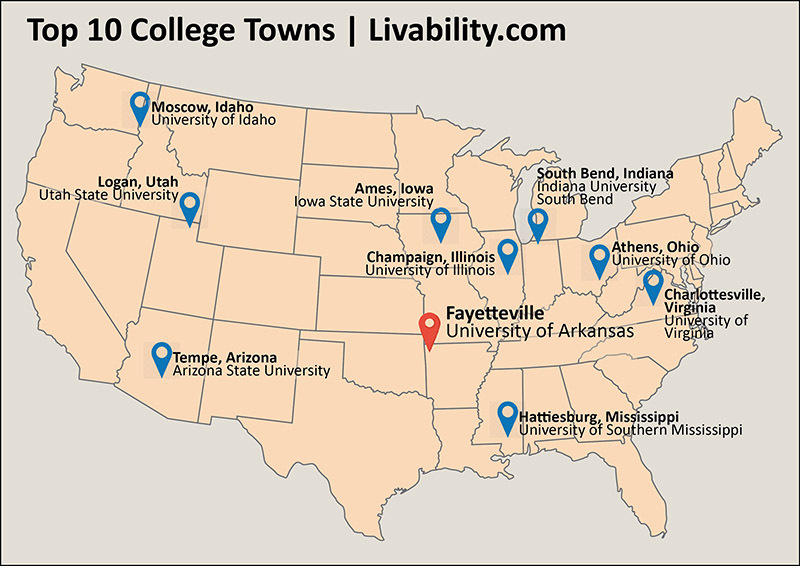 Livability.com has rated Fayetteville among its top 10 best college towns in its annual ranking. "Fayetteville’s southern charm, modern arts scene and innovative business schemes create a place that draws young families who crave a unique yet traditional small-town vibe," Livability.com wrote. "The University of Arkansas provides a base for the local economy that continues to grow as the college expands its programs and companies move in to take advantage of the school's research facilities. Breathtaking natural attractions like the Ozark Mountains provide an abundance of outdoor activities, and areas like Dickson Street offer entertainment options." Livability.com's editors used a play-off approach to choosing this year's list, breaking things up by conferences and grouping cities according to how their colleges are divided by the Football Bowl Subdivision. So the U of A is also the only Southeast Conference town in the rankings. In fact, the next nearest college town on the list, geographically, is at least than 400 miles away. They then calculated livability aspects but skewed the list toward measuring the impact that colleges and universities have on their respective cities and what makes life better for college-aged people. Affordability, high walkability, concentrations of degree-holding residents and population of residents 25-34 were among their criteria. They also checked the recreational opportunities, cultural amenities and entertainment opportunities in each town.